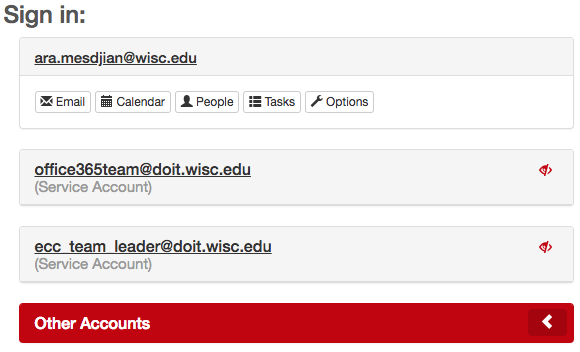 When logging into your UW-Madison Office 365 account, you have the ability to manage the login page - or bypass it all together. Important: If you decide to bypass the login landing page, you will not see any communications or alerts that have been placed on the landing page. The landing page will contain the account you are logged in with (via NetID login) and any other accounts it is linked to. Note: The account you are logged in with via NetID login cannot be hidden from the list of accounts. Go to Outlook on the web. If prompted, enter you NetID login credentials and submit the form. On the Office 365 Sign-in screen, you will your NetID account and any other service account you are linked to. The above example shows a list of accounts that are all visible. The above example shows a list of accounts and some that have been hidden (located within the "Other Accounts" section). To view/access the accounts within the "Other Accounts" section, click on the arrow next to this label. To manage the visibility of any of the accounts, click on the or buttons. Next to each service account you are linked to, you will have the option to either Hide or Show the service account. You will be presented with a confirmation screen, click Confirm. You will be taken to the "Login Page Configuration" within Wisc Account Administration site where you can manage these accounts. Go to step 2 of the next section to continue making the desired changes. 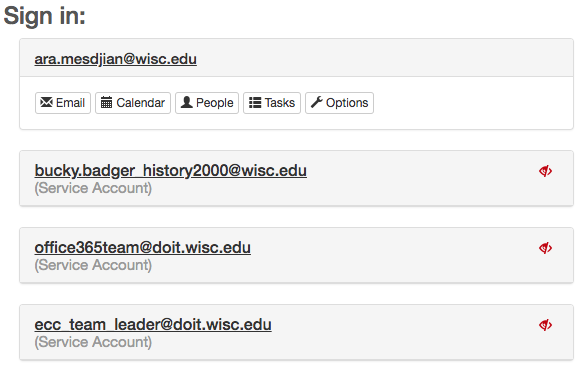 Log in to the Wisc Account Administration site with your NetID credentials. This link will take you directly into the "Login Page Configuration" screen where you will be able to manage the service accounts you are linked to. Click on the desired action. The next time you access (refresh) your Office 365 sign-in screen, you should only see the service accounts listed that are set to be shown. The hidden accounts will be listed within the "Other Accounts" section.